Anand vs. Kramnik should provide the most entertaining chess we have seen in quite some time. Below is a comparison of the achievements of these two chess titans. * PCA Quarterfinals, June 1994, New York, Kramnik-Gata Kamsky (1.5-4.5). * FIDE Quarterfinals, January 1994 Wijk aan Zee, Kramnik-Leonid Yudasin (4.5-2.5). * FIDE Semifinals, August 1994 Sanghi Nagar, Kramnik-Boris Gelfand (3.5-4.5). * WCC Candidates, 1998, Carzola, Kramnik-Alexei Shirov (3.5-5.5). * FIDE Knockout, July 1999, Las Vegas, Kramnik-Tiviakov (1.5-0.5); Kramnik-Victor Korchnoi (1.5-0.5); Kramnik-Veselin Topalov (3-1, including rapid playoff); Kramnik-Michael Adams (Quarterfinal) (2-4, including rapid playoff). * Classical World Chess Championship 2004, Brissago, Kramnik-Péter Lékó (7-7), Kramnik retains. Won Reggio Emilia Chess Tournament (Category 18) ahead of Kasparov and Karpov in the strongest tournament ever held until this time. Won the Credit Swiss Rapid Chess Grand Prix, Geneva beating Kasparov in the final. Joint winner at Dortmunder Schachtage, Dortmund with Kramnik. Won the Knock-Out Championships in Groningen which was the qualifier for the world championship finals. He beat 3 out of the top 10 in the world, Shirov, Gelfand & Adams in the final tiebreak. Won the Chess Classic Rapid Tournament, Frankfurt beating Karpov in the Final. Won 4-2 in an Exhibition against 6 computers at the Aegon Man Vs Computers chess event. One of the few players to play 6 computers simultaneously and win. Won the 6th Melody Amber Tournament, Monaco. Finished overall first and individually first in blindfold and rapid to become the first player in the history of the tournament to do so. Won the Torneo de Ajedrez, Dos Hermanes. This was a Category 19 Tournament. Won the Chess Oscar for the second straight year! Drew the WDRTV Match with Peter Leko in Cologne in August. But as per rules, having played black and drawn, Anand will qualify to play the match next year. Winner of World Cup Chess Championship in Hyderabad. Retained the 2004 Corus Grandmasters Chess tournament title in Wijk Aan Zee, Holland. Anand retained the Corus Grandmasters chess title in Wijk Aan Zee with8.5 points from 13 rounds with five wins, seven draws and one loss. Anand won the Blitz Match for Bulgarian TV beating Veselin Topalov 1.5-0.5 in his first appearance in Bulagria. In Monaco, where he has been a champion many times in the past at the Melody Amber tournament, Anand won the rapid title, once again re-iterating that he was the best player in the world in rapid. He also finished third overall. The joint winners were Vladimir Kramnik and Alexander Morozevich. In a unique match in Russia captained a Rest of the World team, which beat an all-star Armenian team that also had Garry Kasparov in it. This was the second time he has led a world team to such a win. In the past, he led a Rest of the World team to a win over a Russian team. In a masterly display at Dortmund Super GM tournament, Anand won the title in a convincing manner making it two out of two in Super GM classical events for 2004. Winning two major classical events like Corus and Dortmund is indeed a matter of great prestige. Anand outplayed Alexey Shirov in his favourite international venue, Mainz, as he won the Chess Classic of Mainz, an annual event, where he has been winning for last four years. In he past he has beaten Vladimir Kramnik, Ruslan Ponomariov and Judit Polgar in the one-on-one battles on the banks of River Rhine. Anand, steamrollered over Russian Sergei Rublevskyfor his fifth successive Corsica Masters Chess title in Bastia, France. The Indian ace won 2-0, the third time in this tournament he had achieved this wipeout result. Anand won the SaoPaolo Rapid Chess Challenge with a three-point margin over the runner-up. He beat each of his other rivals at least once in the round robin event. His victims included Anatoly Karpov. Anand demolished the field in a tournament held to mark the memory of Paul Keres in Estonia. Anand outplayed each of his five rivals to win the title by an unprecedented margin. Playing in Monaco at the famous Melody Amber Blindfold and Rapid Chess tournament, started with a string of 2-0 victories, which helped him build a huge lead. He won the Rapid, Blindfold and Overall sections, marking only the second time any player has performed a clean sweep. And the first to do so, was none other than Anand himself! Anandplaying in Leon after a gap of two years, emerged winner for the fifth time in six years. Anand won the title beating Rustam Kasimdzhanov in the final. 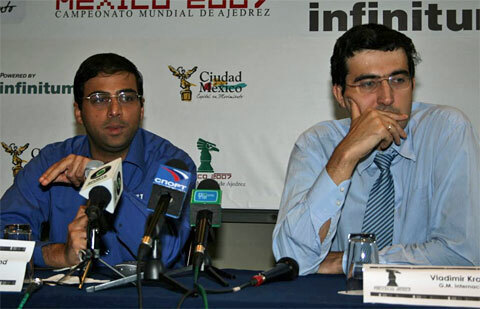 Anand’s earlier victories in Leon have included a match against Miguel Illescas in 1997; match against Anatoly Karpov in 1998, Advanced Chess title in 1999, 2000 and 2001. He was second in 2002. Anand became the only player in the tournament’s 70-year history to win the Corus Chess event five times (1989, 1998, 2003, 2004 and 2006). 1’st place at the Linares tournament. This entry was posted on September 24, 2008 at 4:33 am and is filed under Anand vs. Kramnik, World Chess News. You can follow any responses to this entry through the RSS 2.0 feed. You can leave a response, or trackback from your own site.